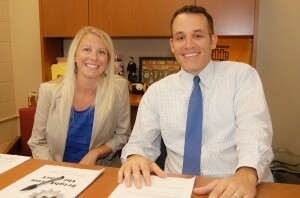 Brian Malek has been appointed principal and Michele Transue has been named assistant principal at Central Manor Elementary School for the 2014-15 school year. Malek replaces Deb Holt, who served as principal from 1992 until her retirement at the end of the 2013-14 school year. He formerly was assistant principal under Holt and began his career as a fifth-grade teacher at Central Manor in 1999. Malek earned a bachelor’s degree in elementary education from Millersville University and a master’s degree in curriculum and instruction from Penn State University. He and his wife, Jennifer, live in East Hempfield with their daughter, Addison. Transue, a 1999 Penn Manor High School graduate, previously worked as a teacher and principal at two district elementary schools. Beginning in 2003, she taught third, fourth and fifth grade at Letort Elementary. She served as acting principal of Martic Elementary from October 2012 to June 2013. Transue attended Central Manor from second to sixth grade. She earned a bachelor’s degree in elementary/early childhood education and a master’s in elementary education from Millersville University. She also earned her principal and supervisory certificates from Millersville. She and her husband, Chris, live in Mountville with their children, Ethan and Hailey. Central Manor is the second-largest school in the Penn Manor district, with an enrollment of about 600 students.